Eleven-time European champions Real, who eliminated Bayern Munich in the quarterfinals, could become the first club in the Champions League era to win the competition in successive seasons. The Madrid clubs have met in the Champions League final in two of the past three years, with Real coming out on top on both occasions. Atletico had also reached the final in 1974, when they lost to Bayern, but have yet to win the competition. Atletico director Clemente Villaverde said the club were not daunted by facing their rivals again, while Real director of institutional relations Emilio Butragueno said past meetings will have no bearing on the clash. The other tie sees Ligue 1 leaders Monaco taking on Italian champions Juventus. Juventus, European champions in 1985 and 1996, lost the final to Barcelona in 2015 but defeated Luis Enrique's side 3-0 on aggregate in this year's quarterfinals. Monaco have only once reached the final, losing to Jose Mourinho's Porto in 2004. They eliminated Manchester City and Borussia Dortmund on their way to the last four. 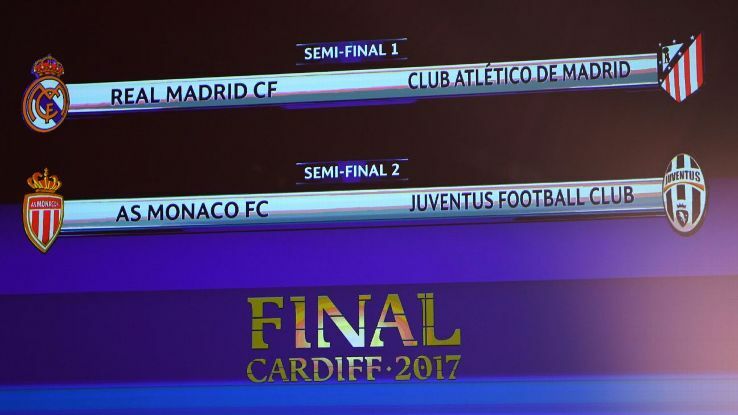 Juventus director Pavel Nedved said the club could go all the way but warned that semifinal opponents Monaco would pose a tough challenge. Meanwhile, Monaco vice president Vadim Vasilyev said his side had the chance to gain revenge for their defeat to the same club in the 2015 quarterfinals. According to the Soccer Power Index (SPI), Real are 67 percent likely to beat Atletico, with Juve rated 70 percent likely to defeat Monaco. The Spanish club are marginal favourites to lift the trophy, rated at 38 percent in the SPI compared to Juve's 36 percent chance. Real Madrid will host Atletico at the Bernabeu on May 2 before travelling to the Calderon eight days later on May 10. Juventus will go to the Stade Louis II on May 3 before Monaco travel to Turin the following week on May 9. The final will be played at Cardiff's Millennium Stadium on June 3.